SUNDAY, SUNDAY, SUNDAY!! I mean Thursday. But those announcers always seem to publicize events that take place exclusively on Sundays. Why is that? Is it a monster truck thing? Perhaps I really don't want to know. Haha! I love it. Harry takes this one, I think (if only because Edward is so distracted by Bella's incessant whining). I don't think either of them can really win, because this is the kind of match-up that begs for endless sequels. Hee, hee, hee. This bleeds awesome. More Monster Death Matches! 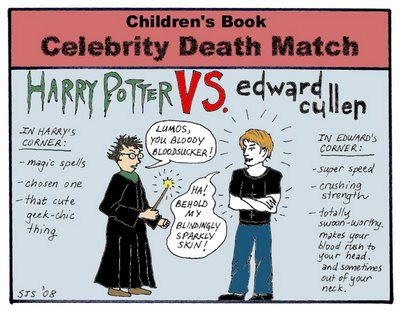 I mean, Children's book celebrity death matches! Can't we do The Wild Things vs. The Sneetches? Does one of them have to survive the death match? Lumos? Are you kidding me? Avada Kedavra, baby. Squee! The Imps Have Our Jane!